Each month I share my favorite products from all the monthly beauty subscriptions that I get. For the most part, these products will be from the past month. Once in a while, it will be something from a couple boxes back. You may see some of the items in this month’s Birchbox in a future Best of the Boxes. they are skincare products and I just don’t have time to try them right now. What I can say is great from November’s Birchbox is Chella Eyebrow Pencil in Tantalizing Taupe. This is the type of tool you use when you want the most defined, yet natural-looking brows you can get. The sleek, European-engineered mechanical pencil is made with a creamy consistency that glides on for a true, hair-like finish. I received this pencil in some other subscription box a few months ago and I LOVE IT. I was sad that it was in my August Empties. This is a great little eyebrow pencil and I am so happy to have a new one! Ipsy had a couple of samples that I like a lot. Doucce Freematic Blush in #49 Zen Orange The time to try peach is now. We’re obsessed with this universally flattering coral shade that leaves a smooth matte finish on our cheeks. Orange you glad you tried it? Buildable and blendable. We swear this is a coral that nobody can mess up. Soft, silky powder glides on evenly every time.Goes the distance. Oil-free formula won’t fade or smudge throughout the day. I like this blush. It is a smooth, creamy formula that blends well. It is nicely pigmented and works well with my light skin tone. It is a peachy shade and doesn’t look orange at all. It lasted all day and has a satiny finish. 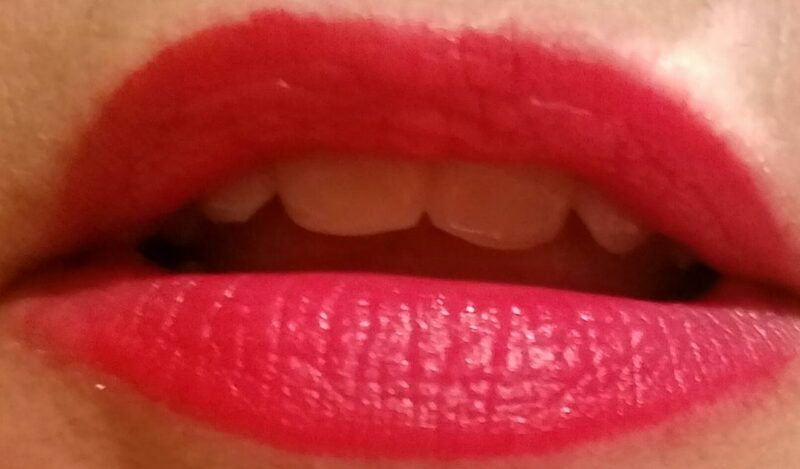 Also in my Ipsy bag was Absolute New York Matte Stick in NFA52 Dark Red – Miss Scarlett. In the study. With the lipstick. But the real mystery is how this stunning red shade gives a perfect matte finish that goes on creamy and won’t make lips look or feel dry.No separate lip liner needed. Won’t bleed or run. Made to stick. Lasts until we decide to take it off. The perfect accessory. Deep ruby color goes just as well with jeans or a ballgown. I always like to try new lipstick formulas and shades. For me, red is not an everyday color but it will be good to have for the holidays. It is a well-formulated matte lipstick. It is creamy and opaque and glides on well. It is a bright, vibrant red that has decent staying power. It does transfer and won’t stay put through eating. It stayed creamy feeling and was not at all drying. While Birchbox and Ipsy were just OK, Boxycharm November 2016 knocked it out of the park again this month. This box is twice as much as Ipsy or Birchbox but it rarely disappoints. Check out these great products. Makeup Geek Blush Powder in Spellbound – Makeup Geek Blushes blend effortlessly into the skin to add the perfect dose of radiance to your cheeks. The finely milled powder guarantees a smooth, buttery feel and a flawless application every time. Rich pigmentation combined with a fade-resistant formula offers buildable, long-lasting color. This talc-free formula is also great for sensitive skin. The Makeup Geek website describes the color as a light salmon with a matte finish. This shade is best suited for fair skin tones. This is a full-size product and it retails for $10. I love Makeup Geek blushes and I love this shade. It looks very nice on my skin tone and works with a variety of looks. Crown Brush C513 Pro Detail Crease – The Pro Detail Crease Brush’s bullet shape and dense Capra blend bristles easily fit into the crease of your eyelid. This brush is made with a high grade of Capra hair, making it easy to clean and maintain with proper care. I am really enjoying this brush. It is crazy soft and dense enough to do detail work in the crease and on the outer corner. I would not have bought this myself so I am so glad I had the opportunity to try it this way. It sells for $12.95. Studio Makeup Eyeshadow Palette – The On-The-Go Eyeshadow Palette includes 9 shades that are perfect for creating day or night looks! In the Boxycharm September 2016 I got the bronzey neutral palette. This is a cool lavender and silver palette that will look so nice for winter and holiday looks. The formula is creamy, buttery, and blendable. They have good lasting power as well. This palette sells for $49.95. In this picture, I am using the Makeup Geek blush, the Studio Makeup palette on my eyes, and I used the brush to apply color to deepen my crease. I can’t complain about my subscription services this month. I got at least 1 product out of each box/bag that made me happy. I received a nice mix of makeup, skincare, and tools.I love getting to try new stuff all the time.